This weekend is the real test for UMD. They have struggled mightily the last two weekends, but that was against upper half teams, maybe marginally upper half teams. This weekend they are playing a team that they should not lose to, a Beavers team that doesn’t have much for wins and UMD has already beaten. If anything is going to be done at the end of this year, it has to start this weekend. Shoot, this is a set up for next year. These are the games that will let fans, underclassmen, and recruits what this team potentially has mentally going towards next year. A bad weekend exposes likely too much softness in the mental area of the game. I would be concerned for the program going forward. Too much on the weekend? No, I don’t think so; this is 11th place BSU they are playing. It is on the road, but it is BSU. UMD needs to show some toughness and get the lead like they do often. Then they need to keep playing and get the win. Finishing. TheBulldogs have gone five games without a third period goal. Over the last 10 games, UMD has scored fourgoals while giving up 16. In the overallseason UMD has been outscored 32-20. Beavers to Watch. BSU sports seniors in five of the top six points leaders on the team. Senior Brance Orban is the leading scorer with only 18 points and the only player with double digit goals is senior Aaron McLeod. Forward to also keep an eye on is senior Jordan George who is tied for second in scoring with 15 points. In nets, sophomore Andrew Walsh has played ridiculously good at times this season, but has taken a slide as of late. If Walsh is not in nets, senior Mathieu Dugasis a capable alternative. StatPack. 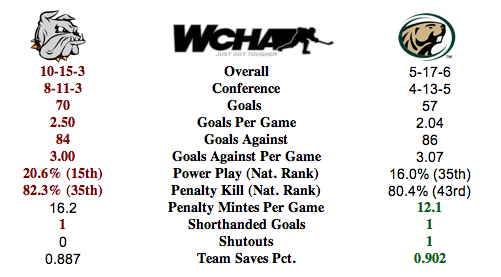 Not much has changed in the statistics department since the last meetings between these teams December 7 and 8. The numbers are really close and the national rankings are practically right on. Here are the updated and most recent numbers at right. UMD is still top three in the nation for penalty minutes per game. One main difference from the last meeting is UMD's Power play ranking. They were fifth and about five points higher success rate. Bemidji is winless in their last 12 games (0-9-3). Around the WCHA and Picks by @afiskness. The last few weeks Bulldog fans have had the unfortunate opportunity to see the wheels come off the bus and a full team melt down occur. All season this team has seamed fragile and the last five games have proved that. There appears to be a lack of on-ice leadership. Once the going gets tough the tough look ahead to the next road series were they can get a burrito from Chipotle and unfortunately Bemidji does not have a Chipotle. This attitude really surprises me as the Juniors and Seniors have been accustomed to winning and do know how to win. One would think they would recognize that a little extra work would put them over the top. There does not appear to be any extra work as of the last few games. Minnesota Twin Cities at Wisconsin (Sunday at Soldier Field): This two game series has the second game being played outdoors on Sunday in Chicago and there will be no home ice advantage for the Badgers in that game. I expect to see a split as the Badgers have been doing a great job of keeping the scores low. Minnesota Duluth at Bemidji State: Both of these teams struggle to score which should result in two low scoring games. The Beavers really do not have the same talent as the Bulldogs, but their style is always tough for UMD. I can easily see this being a Beaver sweep, but will go with a split as UMD should be able show up for at least one game. Fool me…. Michigan Tech at Minnesota State Mankato: The Huskies played on Tuesday night an blew out the Wildcats of Northern Michigan and the Mavericks are coming off a road sweep of the Bulldogs. 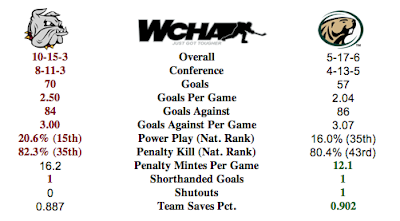 All indications should point to advantage Mavericks, but I will say a split as the Huskies have been putting up a bunch of goals in recent games and generally have been playing good. Omaha at Alaska - Anchorage: The Mavericks are in a 3 game skid and now make the long trip to Anchorage. The Seawolves finally got their first conference road win and should have a little extra pep in their step. The Mavericks are the better team but I don’t think they will get a sweep. I will say win and tie for 3 point for Omaha. UMD Loses Pair Again; WCHA Race Clearer?